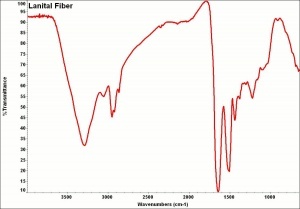 [Snia Viscosa] A trademark for the first commercially manufactured regenerated protein fiber. In the early 1930s, an Italian chemist, Antonio Ferretti developed a successful method to make regenerated protein fibers. Lanital was patented in 1935 and sold in 1936. Lanital is made from casein. Casein is processed with formaldehyde or benzaldehyde and metal salts then pressed through spinnerets to form long, silk-like fibers. Casein fibers are softer and smoother than wool and contain less sulfur. They are not susceptible to moths but can be degraded by some bacteria. Casein fibers are usually cream colored and they accept dyes well but have poor washfastness. Most often casein fibers are blended with wool in fabrics and hat felts. 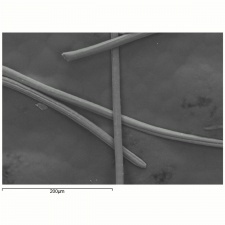 Lanital, along with other regenerated protein fibers, have been replaced by other synthetic fibers, because casein fibers are weak when wet and susceptible to microbiological growths. Insoluble in dilute acids, hydrogen peroxide and most organic solvents. Affected by alkalis. 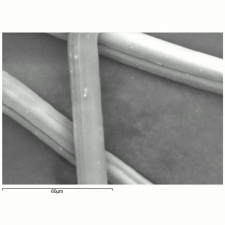 Filaments are smooth. Cross sections = circular, bean-shaped. Diameter=20-30 micrometers. This page was last edited on 1 May 2016, at 07:12.